Most people know Sean Danielsen as the voice and driving force behind Smile Empty Soul. What a lot of people don’t know is that he’s also a very accomplished and impressive solo artist. 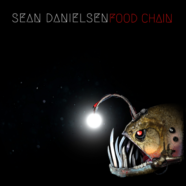 Danielsen is back with his latest solo release, an EP titled Food Chain, which will take some SES fans offguard but will also impress them as well. The EP isn’t what you’d normally expect or hear from the man but shows off his vocal and acoustic skills. The EP opens with a three song knockout in “Waves,” “Rescue Me” and “Beautiful Things,” which will calm you to the point that when the title track kicks in with its Smile Empty Soul aggression, it takes you completely by surprise before going back to the acoustic for “Broken Bones and Skeletons,” which may be one of the more emotional tracks Danielsen has written in awhile. The softer material shouldn’t be too much of a shock for SES fans as their previous record, Chemicals was a little softer than previous SES records was. This is just an extension and takes it to another level. It’s good to see Danielsen going in a different direction from what he’s done with SES. It’s always frustrating when a band member does a solo record that sounds exactly like what they’ve already done- it’s just pointless.